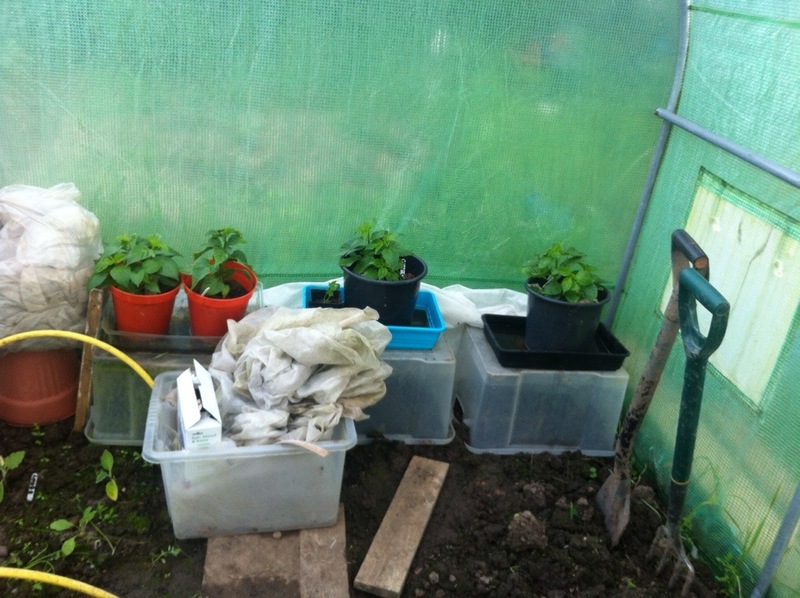 The poly tunnel is burgeoning with triffid like tomatoes, chillies and aubergines. The tomatoes have had to be defoliated and regularly; they have been become very very leafy. They are being fed, but not every day, with watering more regular. What I have noticed is that since I have been defoliating, there have been more yellow fruit. In defoliating, two fruits ended up coming away in my hands. These are marmande and cream sausage tomatoes. I have harvested half a crop of blueberries. These are a mixture of darrow and blue jay berries. The blue jay are smaller, with the darrow being large and quite fat. Both bushes are cropping for the first time, and are grown in large pots. I look forwards to the additional crop to be had from the darrow bush. And we have our first aubergine flower! I nearly missed it amongst the foliage, but did make sure it was tickled today. I had though the plant would be a little bigger, they were last year in the open ground. 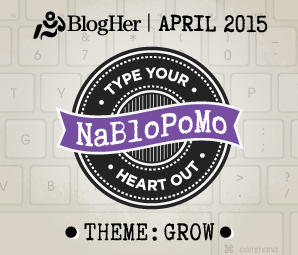 So we shall see if the plant actually crops. These are still quite delicate and wiry looking. Probably in need of a bit more heat and light. 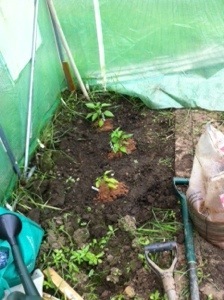 Shall be looking nice at getting them growing a bit more rigorously, once the weekend has settled down. Just need to get bit more of a wiggle on. The plan is to keep them in pots this year whilst under cover in the poly. 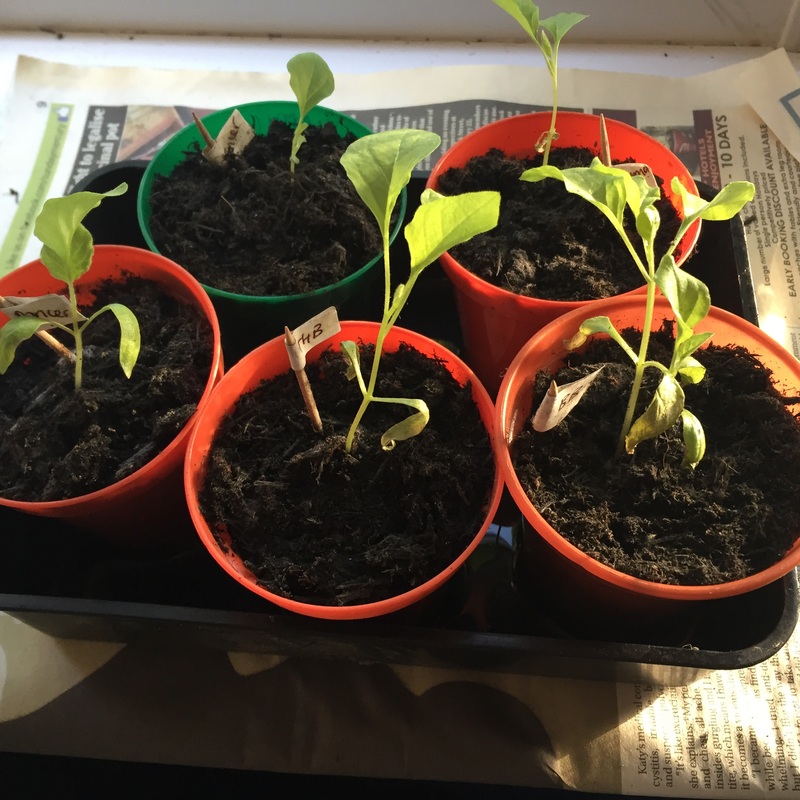 With the aubergines sending out their first set of true leaves, it’s time to pot them up. 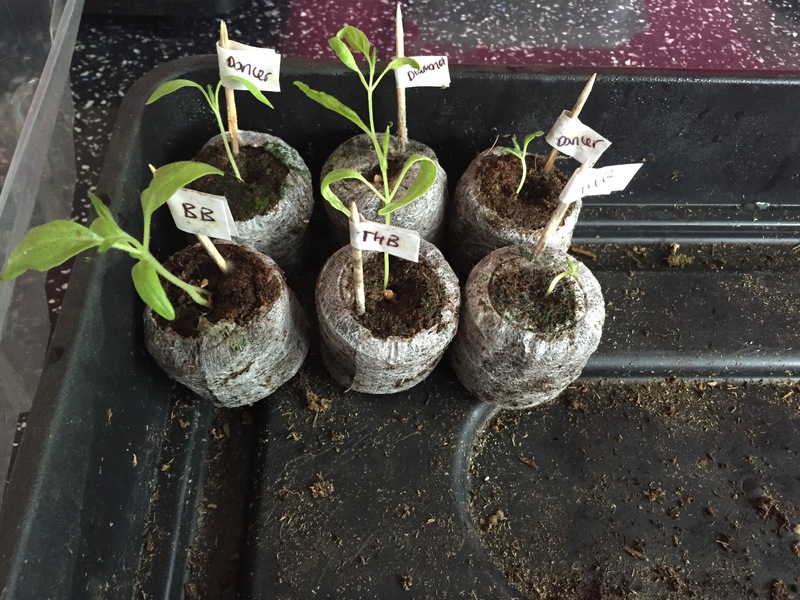 They have been removed from the cold propogater, potted up and placed onto a warm window sill. They are tiny, compared to the tomatoes to whom they are related. Then again, I did sow them a lot later. 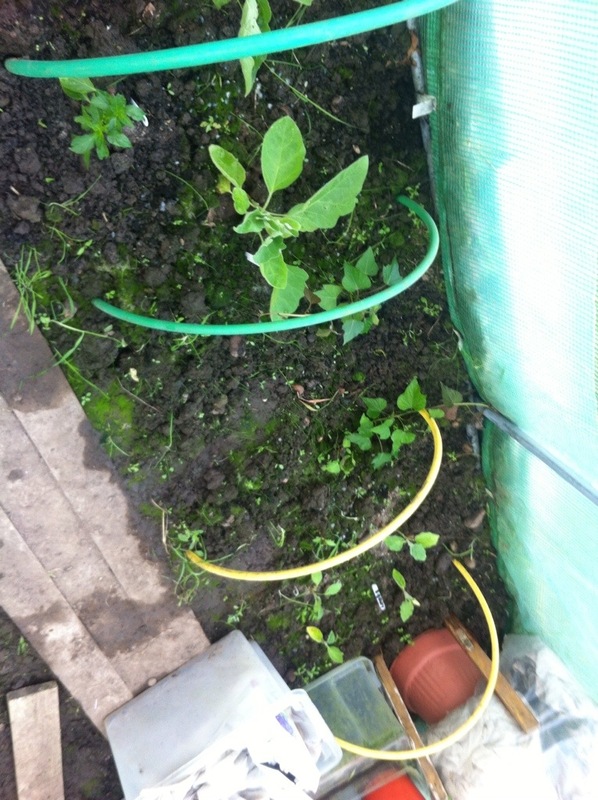 The plants themselves are delicate looking, and it’s probably going to be a while before they end up in the poly tunnel. All being well, they will get a wiggle on, get a bit taller and stronger. It has taken a while, but I finally have some rather spindly aubergines coming through.I did sow quite a few, with there being four varieties. Think they have some way to go, but all being well, they will catch up. 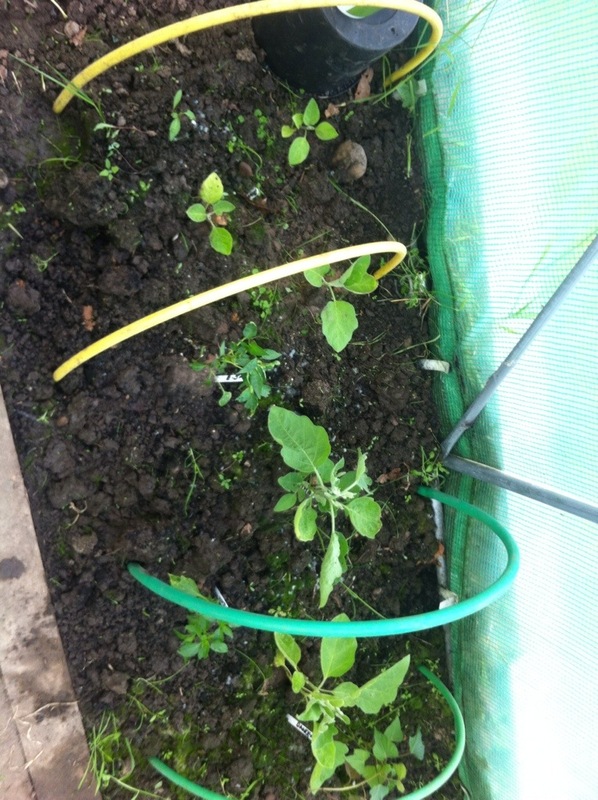 The seedlings are quite dainty, and could do with some warmth and heat to give them a good start. Bit of a panorama of the poly tunnel. We have assorted aubergines; black beauty, dancer,diamond and tres hative de barbentane. The THB is the most developed with at least two fuzzy flowers amongst the velveteen leaves. Most of the chillies are flowering. Nigel has a lots of little buds. The California wonder sweet pepper has actually flowered. There are three of these and the plants are actually quite short. At the back we have the two habanero varieties and then the nagas. All quite leafy; and slowly getting taller. They made it over night, under a fleece. 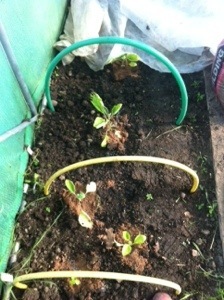 Even had to evict two slugs that found themselves stuck in the builders sand placed around the base of the plants. What I have done is used some broken hoops to cover them a little differently. I’m a bit worried that the aubergines here will get a bit too warm and damp; inviting more slimers. Now it is rented for ventilation. 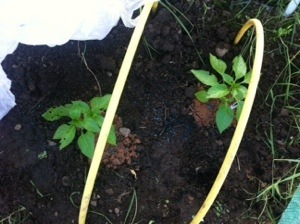 Same has been done with the sweet peppers and Nigel. I went this morning with the intention of planting more gladiolus. 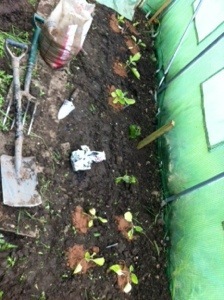 I actually ended up planting things in the poly tunnel. Aunty tish has shared some sweet potatoes. 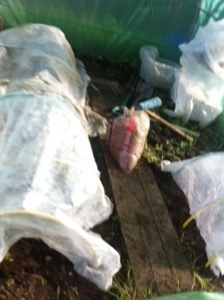 So these are the very things ever to be planted in the poly tunnel. 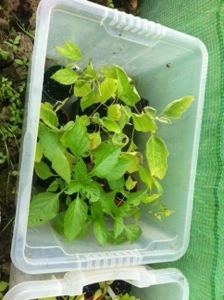 There was also some aubergines and sweet peppers sat in a box. They were looking a bit sad, but reasonably sized. And have now been sunk directly into the ground. We have black beauty, dancer, diamond and tres hative de barbentane aubergines. 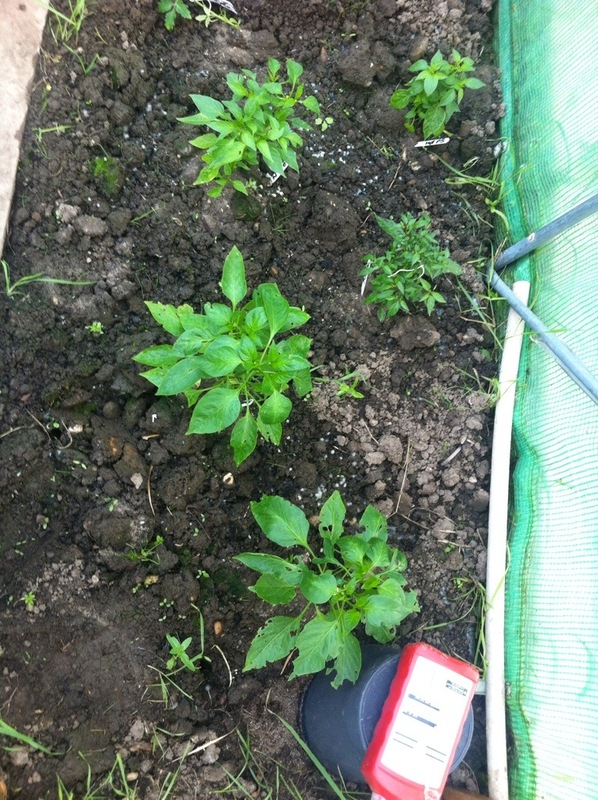 As well as California wonder sweet pepper and Nigel the outdoor chilli. Have been watered in, and around the base I have put sand and the little blue pellets of doom. All of which were then covered with fleece. There is hot patio sizzle, hot thai, and pretty purple in pots still in another transparent box. These are heavily slug damaged at the moment; and I’m going to wait til they get a bit more leafier again.